If you need to replace your old electric cadet-type wall heater or baseboard heater, or if you are thinking about installing a new one, then this article has important information for you. If you care about safety, comfort, efficiency, and maximizing usable floor space, then you should seriously consider using radiant ceiling panels as your heating source rather than putting in or replacing your wall or baseboard heater. Radiant heat ceiling panels are a relatively new and innovative home heating alternative that deliver sun-like heating warmth, are both reasonably inexpensive and remarkably efficient, and vastly outperform older technology baseboard and wall heaters. Safety – The National Fire Prevention Administration (NFPA) 2016 Report on Home Fires Involving Heating Equipment found that in 2009-2013 there were 6,950 home fires caused by fixed electric heaters (like wall and baseboard) which were responsible for a tragic 430 injuries, 50 deaths, and $155,000,000 in damages. The major factors causing these fires included: curtains, clothing, furniture or bedding too close to these heaters (56% of fires); not properly maintaining or cleaning dust, cat or dog hair out of the heaters (30%); or in one case, by a child who threw covers off on a baseboard when getting out of bed. Plus, with these heaters being either on the floor or near the floor, they are safety hazards for young children and pets who can touch the hot grill. Why put your family, your life, or your home at risk like this? Comfort – You have been outside on a cloudy winter day, when suddenly the clouds open up and the warmth of the sun makes you feel warm and comfortable. What you felt was infrared radiant heat. This is the same way radiant heat ceiling panels work, generating that same comfortable, sun-like heating – no hot air blowing, just the warmth of infrared heat touching your body. And this starts nearly the instant a radiant heating panel is turned on. This contrasts with the blowing of hot air by convection that wall and baseboard heaters rely on and that takes many minutes or even an hour to make you feel comfortable. Efficiency – While they are the least expensive of fixed electric heaters, baseboard and wall heaters are very inefficient compared to radiant ceiling panels. Based on several studies, radiant ceiling heaters are 35% more efficient than wall heaters and 50% more efficient than baseboards. And while radiant panels are slightly more expensive than wall or baseboard heaters, the increased efficiency of a radiant heat ceiling panel means that you will recoup the cost of the radiant heater in just 3 years for a baseboard and 6 years for a wall heater. After that, you save money each year. The reason for this difference in efficiency is due to several factors, but the most important is that wall and baseboard heaters operate on the principal of convective heat. All convective heaters heat cold air near the floor, which then rises to the ceiling where it cools, drops down to the floor, only to be heated up again wasting energy. Infrared radiant panels work in a more efficient way – they transfer heat directly using the same principle as how you are warmed when you are outside in the sun. In this way, heat energy is emitted from the radiant ceiling panel and warms you, your furniture, wall, floor, and other objects in your room (which in turn re-radiate that heat back to you) rather than directly heating the air. The air temperature for a radiant heated room is lower than for a convection heated room, saving energy while delivering a superior level of thermal comfort. Maximize living space – Wall heaters and baseboards, being placed on the floor or wall, take away precious usable space where you can place furniture. One of the reasons wall and baseboard heaters are the source of so many terrible home fires is because they are often placed under windows and in areas where you want to put your furniture. 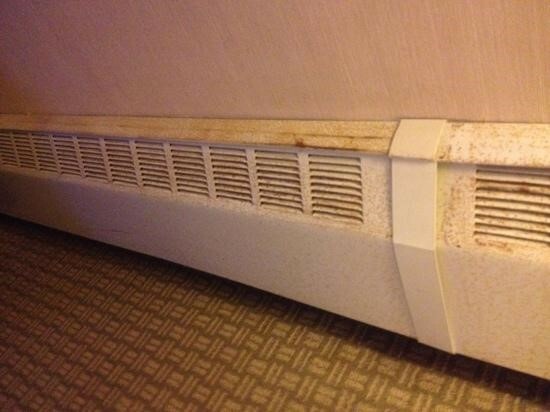 Most often, baseboard heaters are placed under windows where drapes are either a fire hazard if they are long, or shorter drapes can interfere with the convective heating and dramatically drop the baseboard’s heating efficiency. In a similar fashion, wall heaters are put in places where you want your furniture – and remember you must leave at least a 1 foot space on either side of the wall heater to comply with fire codes in most cities. On the other hand, radiant ceiling panels take up no wall space and are safely out of the way on the ceiling, away from little hands, pets, furniture, and drapes. Maintenance – Wall and baseboard heater manufacturers recommend you clean them every 6 months to remove accumulated dust, hair, and other flammable materials which are often the cause of fires. But how many of us actually do that? And since we don’t, we are creating a fire hazard and impairing the efficiency of these heaters. Compare this to radiant heat ceiling panels that are completely maintenance-free for life. Expected life – According to the National Association of Home Builders (NAHB), a cadet-type wall heater or baseboard heater has a 10-15 year expected life. While that is a long time, the NAHB rates radiant ceiling panels with a 40-year life. But beyond what the NAHB says, you should look carefully at the warranty. 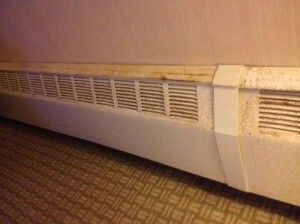 What you will find is that most wall or baseboard heaters only have a 2 or 3-year warranty. On the other hand, one of the leading manufacturers of radiant ceiling panels, Ducoterra, gives a 20-year warranty on their panels, the longest warranty in the industry. Why this is important is both long-term cost, but also convenience. When it is least expected, a wall or baseboard heater will fail in the cold weather, requiring an expensive service call from your local electrician. ← Is Infrared Heating Hazardous To Your Health?